(P1) Rwandan soccer officials have added a new rule to the game: no witchcraft. The move comes after a bizarre turn of events at a match between teams Mukura Victory and Rayon Sports on Dec. 16. 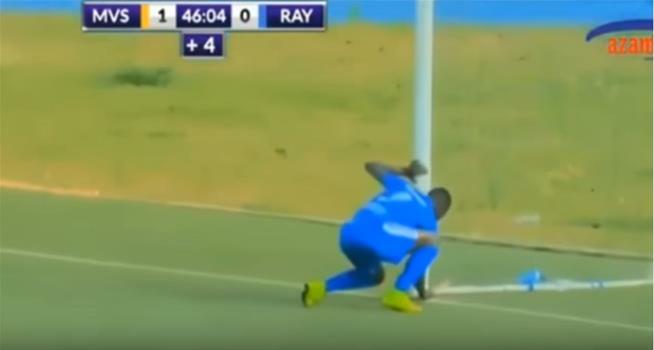 After hitting the crossbar, Rayon’s Moussa Camara can be seen in video footage dashing to one of the goalposts and grabbing an object, one that had been placed there by the goalie as a bit of “juju” to help him protect the net. The goalkeeper then chases him before both receive yellow cards, notes Fox Sports. The even weirder part: After the disruption, Camara scored his team’s tying goal in the match, which ended 1-1. (P2) Under the new rules, players and coaches found to be using witchcraft to try to gain an advantage face fines and penalties, reports the Rwanda New Times. The Washington Post notes that “juju” has long played a role in African soccer. In fact, the Confederation of African Football previously banned witchcraft after Rwanda’s national team was accused of burying a doll behind its net in a 2003 match against Uganda. But a soccer official in the country says the traditional practice gives the nation a bad image. Hence, the new penalties. “Since there is no scientific way to prove the use of witchcraft, these measures will be based upon reports from match officials and anything that is deemed to incite witchcraft will be put under consideration,” he says. Do you believe in witchcraft? Why or why not? What are some symbols of good luck in your country? Are there any traditional practices in your country when playing sports? If yes, describe them. Why did the goalie place an object at the goalpost? The new rule states that players and coaches can receive _______ and _________ if they use witchcraft. In 2003 a _________ was buried behind the goal.